The Florio has a capacity of 1470 passengers and can hold up to 625 cars. Over its 10 decks the Florio offers an array of on board facilities such as a restaurant, 2 bars, cinema, quiet reading area, games room and a shop. Please Note: Whilst we have taken great care in making our Florio guide as accurate as possible, onboard facilities, services and entertainment may vary depending on the date and time of year that you travel, facilities mentioned may change without notification and ferry companies reserve the right to operate vessels other than those mentioned at time of booking without prior notification. Our trip was like a mini cruise ship. Accommodations were excellent, food choices good and we left and arrived on time. Beautiful sunrise from deck and scenery upon arrival in Palermo. That was a really nice trip. I was lucky enough to have my cabin of 4 to myself! If you book, I would highly recommend you book a cabin to have some comfort for the night. We travelled with our young children. It was a great journey and we loved it. Kids enjoyed the playing area. Ship was clean and staff was helpful. We really didn't know what kind of ferry or conditions we might encounter on the trip. In an effort to make the trip as palatable as possible, we booked a First Class berth(I recommend highly). The ferry was clean, had the feeling of a cruise ship once you got to the lounge area. Even the small twin beds in our cabin were very comfortable. Spent most of the trip sleeping in comfort. Great surprise, highly recommend. Great staff also, only suggestion would be to bring your own food and drink. They supply both and have a nice buffet and dinner if you prefer. Me and my wife we travelled with different company but never with Tirrenia. The ship was amazing. Tidy and cleaning, competent staff made our journey wonderful. The next travel experience we will choode Tirrenia again. The journey went well. The only problem of this company, that I always find when I travel with them is the air conditioner. Temperature is too low. During the night it reached polarar temperatures. I had goose bumps! Really bad!!! 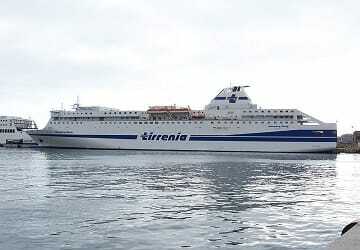 Excellent choise the Florio ship of Tirrenia. Comfortable and quiet on seats, positive experiece. It was a better journey than travel by train! Good time, clean cabins, perhaps the cafè shop was full of people taking busy seats reserved to who wants to buy. A ship I sure will use again. I discovered the cabin has resonable price but still a bit high, is a perfect and restful way to travel for 10 hours.